Although there are many stories and legends about the origin of chili, research points to Texas as its most likely birthplace–San Antonio, Texas to be specific. 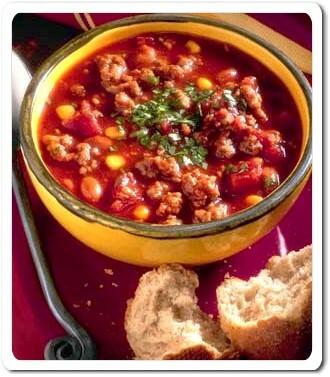 However, there is little doubt that this popular American stew is heavily influenced by Mexican spices and ingredients. After all, San Antonio was founded by the Spanish in the early 1700s. It is said that in an effort to quickly establish their presence, the King of Spain sent sixteen families from the Canary Islands (one of Spain’s sovereign territories) to San Antonio to settle the area. In their attempt to replicate the much loved spicy, pungent stews of their homeland, these immigrants found it necessary to substitute their native meats, spices, berries, peppers, and other ingredients with those sourced from the local Mexicans and Indians. Thus chili was born. And while some ingredients may have changed over the years (beef instead of buffalo or wild game; domesticated chilies instead of wild peppers, known as “chiliquitas” for instance), the basic recipe for the dish remains the same today. In the 1880s, a number of women known as the Chili Queens, started setting up stands in an area of San Antonio known as Military Plaza from which they sold chili (or “bowls o’ red,” as it was called) for ten cents, including bread and water. It wasn’t long before word of these open air stalls spread and Military Plaza became a tourist attraction. In fact, so great was the Chili Queens’ fame that the 1893 World’s Fair in Chicago had its own San Antonio Chili Stand from which to introduce this southwestern elixir to the world outside the American West. The reign of San Antonio’s Chili Queens ended in September of 1937 when the local health department implemented sanitary standards requiring the Queens to adhere to the same health codes as brick-and-mortar restaurants. Although Mayor Maury Maverick reinstated their operating privileges in 1939, the health department developed even more stringent rules were reapplied in 1943 and the Chili Queen’s disappeared from the city forever. 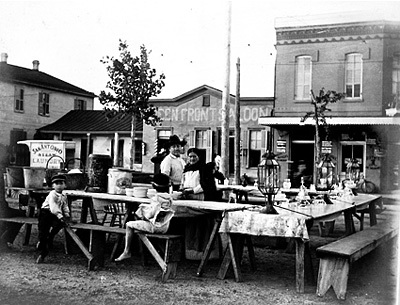 By the twentieth century, chili joints had made their debut throughout Texas and were spreading outside the state. During the 1920s and 1930s, “chili parlors” popped up across the midwest and soon there was hardly a town anywhere that didn’t have at least one chili parlor–often nothing much more than a room with a small stove, counter, and stools. Some of the best known chili parlors include Taylor’s Mexican Chili Parlor that opened in 1904 on Main Street in Carlinville, Illinois. Like most early chili joints, Taylor’s is a small place with a counter and six wooden stools, a dozen well-worn tables, and plenty of framed photos and newspaper articles lining the wood paneled walls. As one customer said, “People don’t come here for the ambiance. They come for the chili.” And chili they have–a fiery concoction not for the wimpy palate or faint-of-heart, with beans on the side. Another of the midwest’s well known chili parlors is Big Ed’s Chili Mac’s Diner on Pine Street in downtown St. Louis. Big Ed’s signature dish is called a “Slinger”–two burger patties with slabs of melted American cheese, topped with hashbrowns, two eggs, and smothered in chili. A chili-head’s delight still available today. Probably one of Texas’ most popular chili parlors of the time was Bob Pool’s chili joint which operated in downtown Dallas from the mid-1940’s to the mid-1950s. Located across Main Street from Neiman Marcus, one of America’s elite department stores, it was said that the store’s president, Stanley Marcus, was not only a frequent diner but bought and shipped Pool’s chili to friends and customers around the country. Another Texas chili aficionado who is a must mention in any chili story is Frank X. Tolbert, historian, Dallas Morning News columnist, chili enthusiast, and co-founder of the World Chili Championship Cook-off in Terlingua, Texas. He also founded and operated the Original Frank Tolbert Chili Parlor. 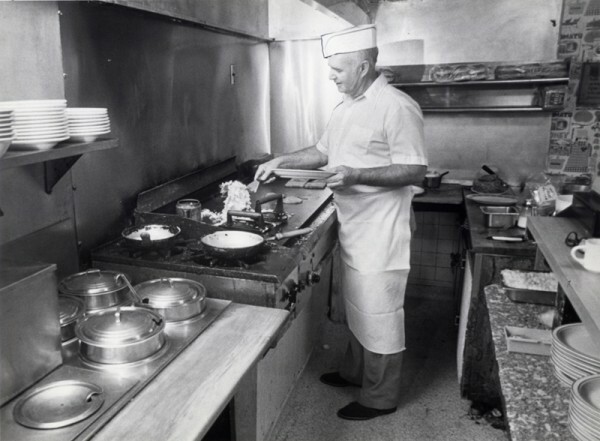 Tolbert opened his first restaurant in 1976 in downtown Dallas and by the time of his death in 1984, there were three. But by 2003, all of the original locations had closed. Then in March of 2006, Frank’s daughter, Kathleen, revived Tolbert’s in a restored building in the historic district of Grapevine, Texas. Today, chili can be found throughout America in a variety of styles. In addition to traditional Texas chili (chili con carne), which is thick, spicy, and never cooked with beans (although sometimes served on the side), there is the very popular Cincinnati-style chili (invented by Greek immigrants), vegetarian chili (also known as “chili sin carne”), green chili (chili verde), a moderate to extremely spicy chili usually made with pork and popular in New Mexico, white chili made with white beans and turkey or chicken meat. In addition to the various styles of chili, it seems each region of the country has their own favorite way of serving chili. 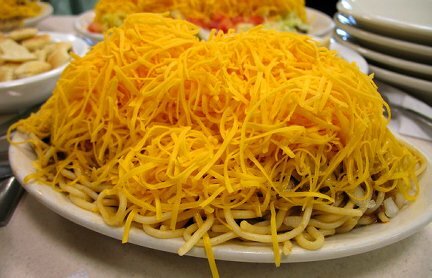 For example, there is Cincinnati’s chili mac, or “four-way.” This dish consists of spaghetti topped with beans, topped with chili, and finally cheddar cheese. Add diced onions and you have a “five-way.” This is also the way chili is eaten in the U.S. military. In Texas, where chili is the official state dish, it is usually enjoyed by itself, garnished perhaps with a dollop of sour cream, some chopped onion, and little cheddar cheese. And while the purists would never add beans to their chili, much of the time it is accompanied by a cup of pintos and a chunk of cornbread or tortillas. Texas is also the home of “Frito pie.” That classic southwestern delicacy made from layers of Fritos corn chips, chili, onions, and cheese. So no matter how you choose to enjoy your chili, enjoy it you should. And the best way to ensure you do, is to make your own–hot or mild, spicy or sweet, beef, pork, or meatless. We’ve included several recipes here from which at least one (or a variation thereof) should suit your taste buds. Remember chili can be just about anything you want it to be, except one–it’s not Mexican food!